stamps happen to be on my desk lately. Why you ask? Well, basically because I have been waaaaay too lazy to clean up my supplies and therefore, they are sitting on the edge of my "to clean and put away" table. 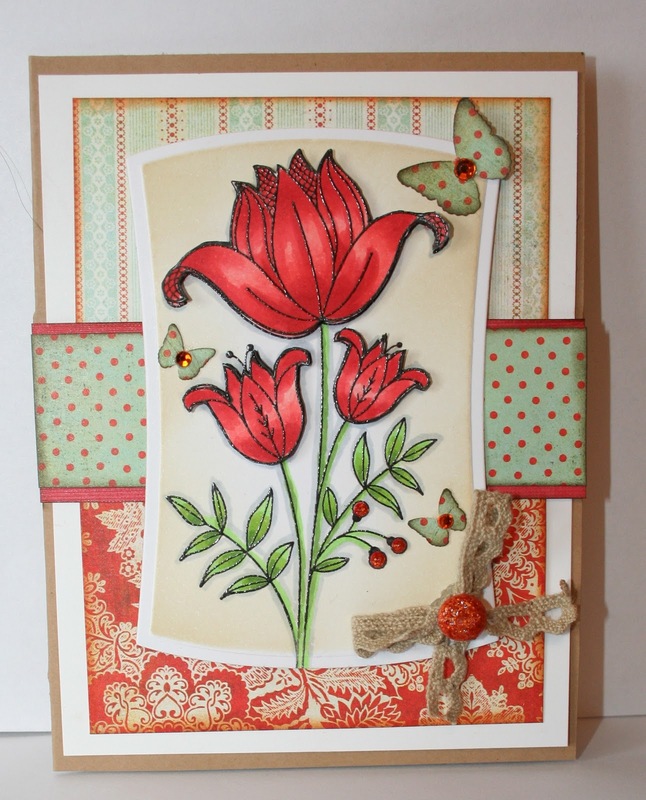 So, without further ado....here is another HA stamp that I always like to use ;-D called Tall Flower K5431 (but the weirdest thing is that I absolutely cannot find it anymore on the HA blog even though it is not a very old stamp...) I also used up some scraps of pp that I had out as well as going the extra mile (at least for me) by punching out some butterflies to add to the card. I like it....I decided against a sentiment as it seemed like I was in danger of over cluttering. Here you go! Thank you for stopping by today. I appreciate your comments. And, wow! Have you all been getting some good looks at all the pics coming out from CHA2012? Some fabulous looking products! Absolutely gorgeous! I love this tall flower in the vibrant colors you've used! I want to get that die shape too, it's fabulous! Another beautifully coloured flower, Sheila. Gorgeous papers and lovely layout, too. Love your coloring, Sheila. 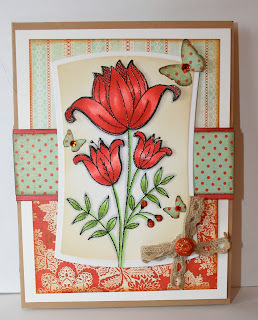 And this is a great match with the paper (how about the current Lily Pad Cards challenge?). I love no-sentiment cards because when I need something I can stamp it inside. Love that bow and, btw, I have ordered some of those Candi thingys you recommended. So pretty! There have been WAY TOO MANY new things from CHA! A girl could go broke in a hurry!! I love your colours today Sheila! This is such a beautiful card and I especially love the butterflies! Sheila, this is a beauty! Funny you can't find that stamp at the HA site, it is relatively new, isn't it? At any rate, I love the pretty colors and layers of your card. Beautiful! Absolutely GORGEOUS, Sheila! you so rock with this stamp and pattern paper...Just stunning!Thank you kindly for always being so encouraging to me! HUGS! So beautiful, I love the coloring on the flower and how beautifully the PP coordinates! totally beautiful Sheila. It is a wonderful stamp and really looks stunning on that label. Beautiful cards. Love your blog! So many pretty cards!